Generation rent is a term to describe how many young people are unable to buy a house, but need to privately rent. Since 1993, house prices have risen significantly faster than incomes, making a mortgage out of reach for many people under the age of 30. 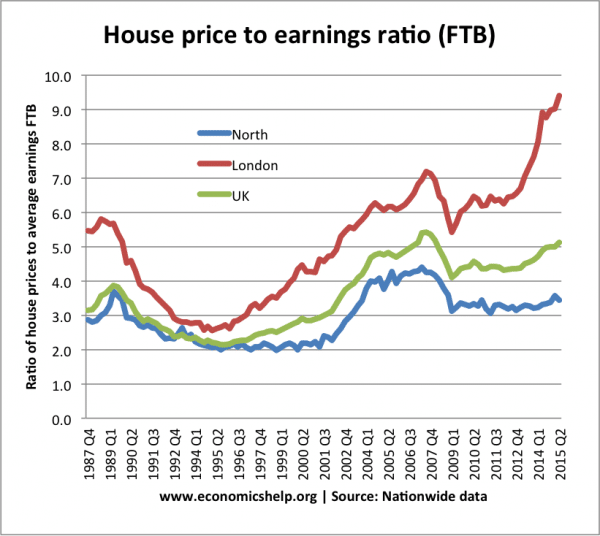 Rising ratios of house price to earnings for first time buyers (FTB). The UK has one of the most expensive housing markets in the world. Due to rising house prices and rents, we have seen a fall in the proportion of mortgage owners, and a doubling of the number of private renters. Because of the housing shortage, private rents have also been rising faster than inflation. For workers in London, renters can pay up to 50% of their income in rent. 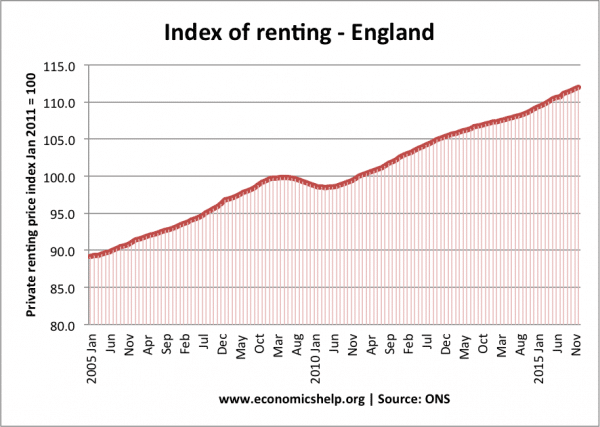 Index of private renting in England. In Central London, average rents are £2,583 a month. This compares to a low of £663 in the north of England. Inequality between property owners and renters. The traditional method of measuring inequality is to compare average incomes. However, average incomes only tell part of the story. If renters are paying 50-70% of their incomes on rent, the discretionary income they have is relatively low, compared to a pensioner, who has paid off their mortgage and is living rent free. People with a mortgage typically spend 19% of their income on mortgage payments (£612 a month) . Those who rent typically have lower incomes; privately renting accounts for 50% of income (£702 a month), though this falls to 45% after benefits. This has an important impact for government policy. It is not enough to look at incomes – after housing cost incomes are a much better guide to actual living standards. In addition, there is greater scope for inequality between generations. Whilst pensioners have benefited from a triple lock guarantee, young people have faced numerous issues making living more unaffordable – rising costs of tuition, student loans, rising housing costs and stagnating real wages. The problem renters face is that there is no end in sight for paying high rents. It is one thing to pay £2,000 a month rent when you are working and have a good salary. However, when people retire, incomes will fall, but private rents are likely to keep rising. Many people will be unable to meet rents when they retire – forcing them to move to cheaper areas, keep working or more government benefits to meet housing costs will be required. When people take out a mortgage, mortgage payments don’t rise in line with inflation. Over time, with rising real wages, mortgage payments as a % of income tend to fall. 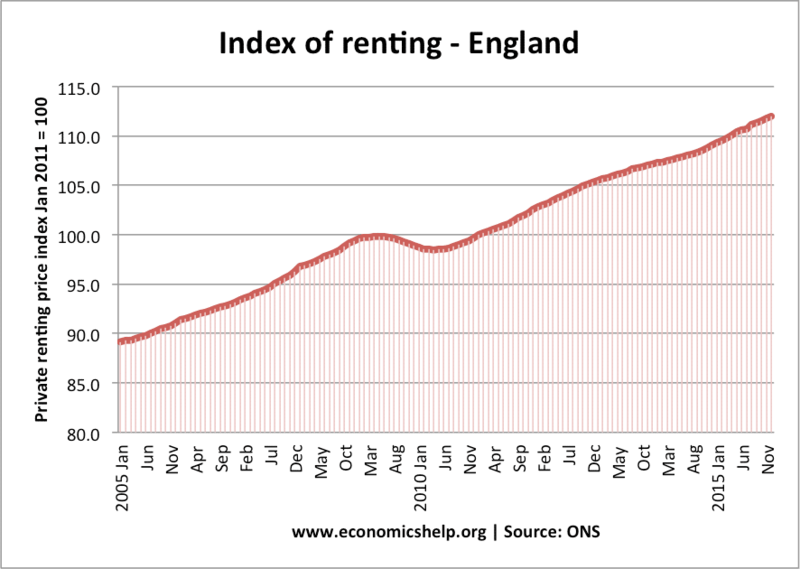 However, rents are rising at least as fast as inflation (and in some areas higher). Therefore, there is a big discrepancy between those who buy a mortgage and benefit from low interest rates, and the cost of private renting. 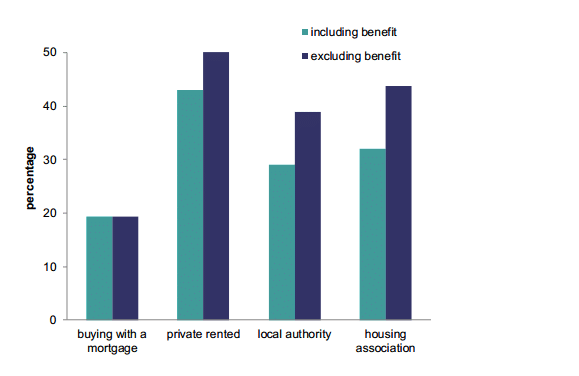 One of the biggest growth areas of government social security spending (apart from pensions) is housing benefit. The housing benefit bill now tops £24 billion (2014) and has increased due to the rise in private sector rents and the increased numbers renting from private sector. Five million people were entitled to housing benefit in 2014. By comparison, government spending on unemployment benefits is approx £4-5bn. With rising rents and a rise in number of households, the housing benefit bill is likely to keep rising. One feature of the UK housing market is the variance in rents between different parts of the country. 20% increase in London rents since 2011. 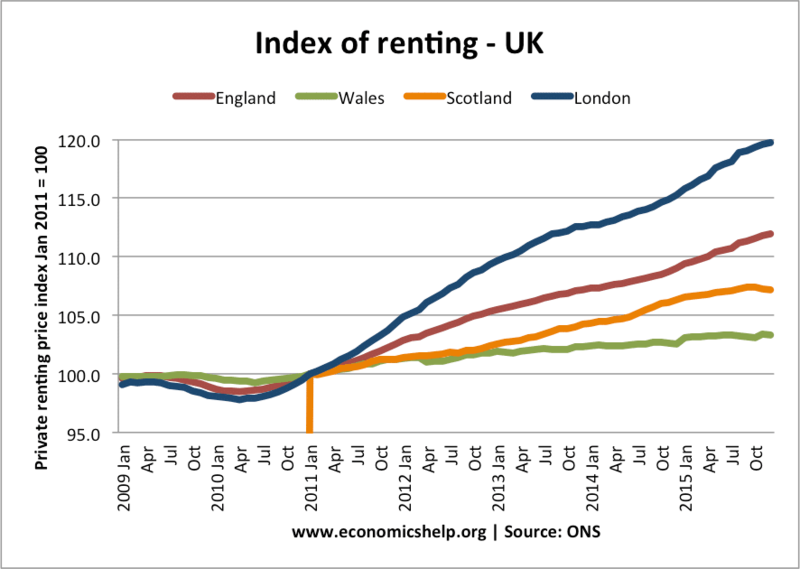 Compared to just 3% increase in rents in Wales. With London rents becoming unaffordable, many workers are considering moving out of London to areas of the country with more affordable rents / chance to buy. This will have an adverse effect on the London labour market, with shortages of key public sector workers, such as teachers, nurses and doctors. In many countries, such as Germany and France, it is more typical that people rent. The UK is unique in cherishing home-ownership so much. German has roughly 50% of households privately renting. Privately renting can give more flexibility for people moving around. Also if interest rates rise from the current lows of 0.5%, the balance between home-ownership and privately renting may change and owning a home may be less attractive than it is. However, the share of income that many people are paying on renting is a matter of concern. There are 1.8 million on the waiting list for social housing, and in many areas the shortage of supply is pushing up private rents, which means the problem will be difficult to solve. One consequence of the housing crisis is that the number of houses built may need to drastically increase. But, this in itself will create issues as there is often local opposition to building even a moderate number of houses.